Blade length : 61.3 cm or 24.13 inches. Width at the hamachi : 3.02cm or 1.18 inches. 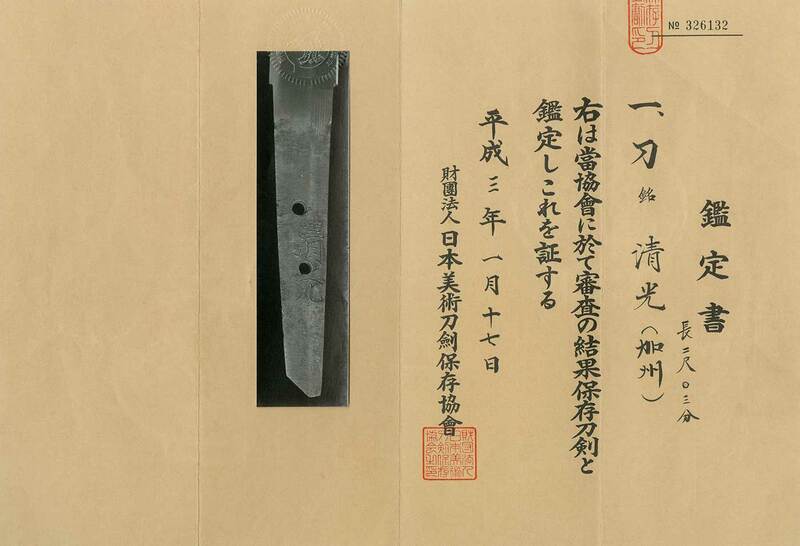 Width at the Kissaki : 1.22 cm or 0.48 inches. and thick with small sori and regular Kissaki. Jigane :Itame had well grained with jinie attach. Hamon :Niedeki suguha rather tight. Special feature:The Nakagojiri shape is typical Kasyu nakago. The most well known sword maker is Harima Daaijyo Fujiwara Kiyomitu. Cyobei Kiyomitu ia called Hinin Kiyomotsu. and also Kaga domain and also other districts made Hiningoya. I think it was very hard time for making swords. in order to spend very severe time. Tsuba :On the round iron tsuba, some design engraved open work. Menuki : Kiri mon(family crest) in engraved. Fuchikashira: On the iron, iron lines are engraved. From Aoi Art:This sword might be made by Cyobei Kiyomitsu. and lost his work and had to live in a small rabbit hatch. While in this poor condition, sword makers made swords.